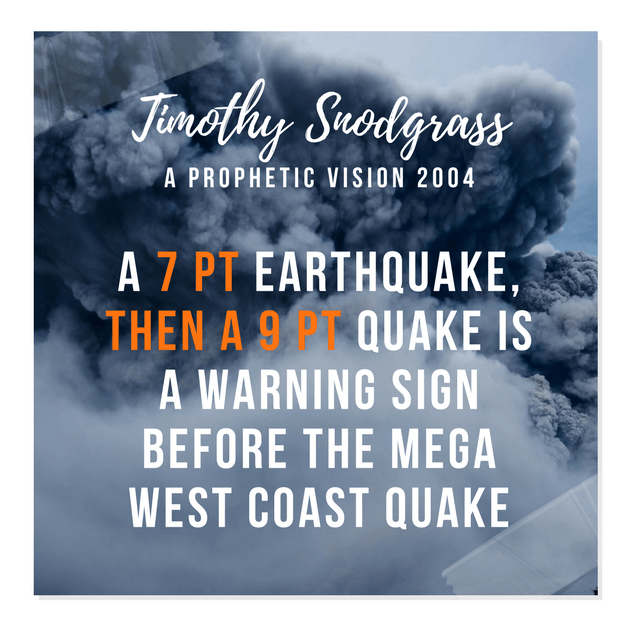 John Shorey “You can take it to the bank that a mega 9.2 quake will hit the Northwest. On May 14, 2004 — Israel’s Independence Day — I received the following vision shortly after arriving in the United States from the Philippines. Vision: Immediately after invading Taiwan, China had invaded the Philippine Islands. U.S. troops had once again come to the aid of the Philippines — as in World War II — and were fighting along side Filipino soldiers. But the absence of U.S. air superiority (because of the closure of our military bases in the early 90’s) led to a quick defeat of our joint forces. U.S. soldiers were being slaughtered by the thousands, and atrocities being committed by the Chinese a thousand times worse than anything we have seen in Iraq. In one segment of the vision, hundreds of Filipinos had been gathered up in a straight line to be shot by the Chinese for ‘collaborating with Americans’. A little boy ran in between the machine guns and Filipinos and shouted “Stop!”. Stunned, the Chinese lowered their guns to take a closer look at the small boy, then suddenly dropped their riffles as the anointing of the Holy Spirit fell like a heavy weight over their arms. The little boy I recognized as my son, Joshua, and his age in the vision appeared to be close to his present age. Chinese troops were patrolling the streets of the Philippines from the tip of Luzon in the north to the city of Zambian in the South, and darkness fell over the land as many martyrs spilled their blood upon the soil of the islands of the sea. It is urgent that we intercede for the leaders of China and Taiwan, because the enemy is once again trying to create a Third World War. We are not to fear the future, but intercede to change the future. World War II could have been averted through strategic intercession, but the Church in that generation did not recognize the urgency of the hour in which they were living until world events overwhelmed them and it was too late. Let’s not wait till it is too late, but intercede now, for history is now in the process of being written. Note: Less than 24-hours after this word was spoken in Bend, Oregon, China threatened the destruction of Taipei, and threats against Taiwan continue till this day. Also today ( May 19, 2004), a strong 6.5 quake shook Taipei, and we’ve been warned of larger quakes in the 8 to 9-point realm which will follow in the China-Taiwan region. Continue to intercede for China and Taiwan, for if war in the Asian-Pacific region erupts, war in America will follow. Just as it is important to pray for the leaders of China and Taiwan, it is equally important to pray for the leaders of the United States and Israel, which are both on the verge of major wake up calls. Strategic intercession can tilt the balance. Keep your eyes closely on world events. A major earthquake in Alaska in the 9-point realm will be preceded by a smaller quake in the 7-point realm SOUTH of Alaska on the U.S. or Canadian Coast. This smaller quake will be a divine warning that time is short to avert a Great Quake. Intercession towards the United States and Israel can affect the timetable of these events. The preceding word was a small excerpt of the message spoken in our Bend, Oregon meeting on Saturday, May 15. The Presence of the Holy Spirit was very strong in the meetings, and following the word to intercede for China, the United States and Israel there was an anointed time of ministry and personal prophecy.